If you have missed the last four posts of this series, you can find them by following the applicable links - Post #1; Post #2; Post #3; and Post #4. I saved this one for what I think should be the last post in this series (inspiration for more might come if you pray hehe! ), because I believe this is the scariest myth of all. Many christians have stuck so tightly to this myth that I once felt the moment you announce your relationship to your pastor, you are on a journey of no-return....well until death parts you, and believe me, death sort of forgets you exist when you are in such a situation. So to avoid tales that touch, it is a rule for me to not announce my relationship to the church leadership until I am 100 percent sure I am ready to embark on the journey. Don't feel pressured to follow my rule. Please do what works for you. I'll share a story about coursthip. It taught me something about courtship although I'm only realizing it now - a successful courtship can be one that does not end in marriage. A courtship should be about you getting to know each other better in preparation for marriage but that does not mean it has to end in marriage. A successful courtship can result in you parting as friends, being realistic with your differences and understanding that you are not doomed simply because you refused to go through with it till the end. Unfortunately, many Christian brothers and sisters believe that courtship must end in marriage, so they keep patching the holes and ignoring their differences. Don't fool yourself. Marriage should be enjoyed not endured. You don't have to go through with it if the spark is not there. You don't have to endure it because your pastor 'hooked you up'. You don't have to stay in it because you're scared you won't meet someone else. Be realistic; be genuine with yourself, and above all, be happy. XOXO. Let me just say from the beginning that I sincerely think people who believe this are gluttons for punishment who are too lazy to seek out the right person, or too impatient to wait for the right person. It is a very common ideology, even among christian brothers and sisters, that a person can be changed if they are provided with the right guidance in a romantic relationship. I see it happen every single day - a christian brother picks a sister he believes is too worldly, and sets his sight on winning her soul for Christ through marriage. A Christian sister picks a brother who's set in his ways and starts to strategize on ways to change him...all in the erroneous hope that this will increase her closeness to God and make her a favorite of heaven. I don't know if 'sad' is an apt description for these thoughts or if 'ignorance' is more descriptive. Whichever words you choose, I hope 'wrong' is one of them. I find it disturbing first of all that people want to change other people - not to help them become better versions of themselves or help them maximize their strengths, but to change them completely to someone they believe they can live with. The moment a christian brother hears a lady he is interested in drinks alcohol, he starts to strategize on bible verses he can send to her. The moment a sister hears a brother she likes is already sexually active, she embarks on prayers and fasting to motivate the holy spirit to arrest him. These 'spiritual' antics continue and instead of acceptance, the relationship becomes one of correction, coercion, and sometimes obsessive control. Funny isn't it? Rather than walk away and engage a more suitable spouse who shares the same values, many people seek to control and hope to change grown people who are not uncomfortable with the way they live. The saddest part is that many of our christian brothers and sisters go into marriages with partners who are clearly unsuitable for them with the hope that marriage will change them, love will change them, prayers will change them, stability will change them. If you've been promoting this school of thought anywhere, please stop. Just stop. My question is if that person is unsuitable for you, why don't you just move on? What makes you think you are qualified to change anyone? If there is one myth many Christians believe wholeheartedly, it's the myth of 'Christian dating' and what it entails. There is a general belief that if you follow the rules of Christian dating, then your marriage will be successful. Why then are many christian marriages hitting the rocks and lacking fulfillment? Many churches have different definitions of what christian dating entails but here are some constant points that are not debatable: 1.) You must ensure from the on-set that your partner is a born-again christian 2.) You cannot spend time together without a chaperone else you fall into temptation. First things first, you have to ensure that your partner is a born again christian before you even take a step further in your friendship or agree to a courtship. How do you ascertain this fact? By asking two important questions "are you a born again christian?" and "when did you give your life to Christ and what happened?" I have my own questions: How does answering yes to the first question prove anything besides the fact that the person you're asking responded to an altar call in church? Does it prove that his/her mind has been renewed? Does it prove that he/she lives each day in line with God's word? Nope. Secondly, how does narrating the commitment of one's life to Christ prove anything? What assurance do you have that the person's life is still with Christ? People give their lives to Christ and they take their lives back sometimes. Why does something need to happen for a person to give their life to Christ? And why is it deemed an 'incomplete' decision if nothing significant happened for that person to take that decision? Do favorable answers to these two questions set the foundation for a stable relationship? NO. Do they tell you what you really need to know about the other person? NOPE. What they do is give that person room to prepare textbook responses that suit the image you are looking for. After you get married, you start wondering how this born-again sister/brother is capable of emotional, physical and psychological abuse. You followed the due process why aren't you getting the results? This leads me to the second condition. I have heard it so many times - the "she's not wife material" and "he's not husband material" excuse. It appears everyone is hunting for a particular type of material which brings up many questions in my head. What makes a person wife material or husband material? Where did this ideology come from and why do we believe in it so much? I have met many married wife materials and their husbands who are enduring their relationships and not exactly enjoying them. I have met many husband materials and their wives who are on the brink of divorce and starting to develop bitterness towards one another. If the wife/husband material myth was meant to bring perfect marriages, what then is going wrong? Why are many wife and husband materials abused in their relationships? Why are they unhappy? Why do they lack fulfillment? It's because the idea of husband/wife material as we see it is a flawed one that has resulted in many wrong marriage decisions. The idea of a person being a wife or husband material stems from a rule of qualities that person is expected to have. E.g. A wife material should be submissive, respectful, be able to keep the home together, be prayerful, be able to bite her tongue when necessary, be a great cook and domestic house chores type of person...the list goes on. A husband material should earn more than his wife, be more educated than she is, take the responsibility of her well-being upon himself...again the list goes on. Now there is nothing wrong with the list if it is in line with what YOU as an individual can live with. However, you must bear in mind that these list of qualities suggest that perfection is required to build a happy marriage. I can tell you now that that is so not true. The fact that a person is perfect on paper does not mean he or she will make a great partner. Building a great relationship is actually more dependent on chemistry than a checklist. 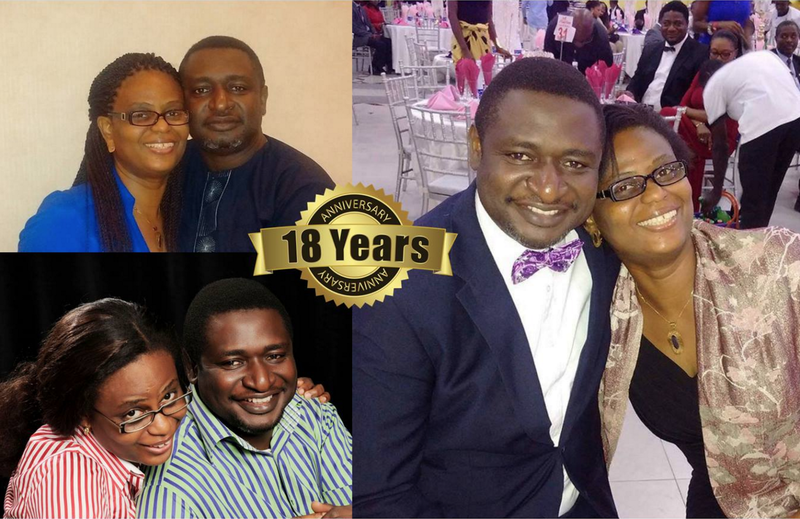 Today we celebrate eighteen years of a wonderful marriage. We started not knowing too much about the journey but one thing that we knew was that it was going to work. We trusted God and made God the centre of our relationship. We have also been marriage counsellors for over 12 years and we have also learnt what it takes to make a happy marriage. Husbands and wives should watch this. This is a possible conversation that may have taken place between Adam and Eve after the fall in the garden of Eden. Listen and learn. No matter what happens, the two should always be one. No matter what happens, the two should always be one.